For fans this boxed set by FASA represents a mine of source material. I'm no expert on the series, but it looks like the writers put a lot of love into the writing. 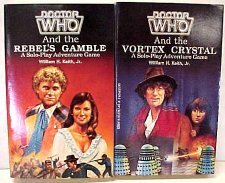 The 1st printing on the left (white books) contains information on the 6th Doctor missing in the later printings. "The Master has stolen a weapon that will give him ultimate control of the universe and of time itself. The Daleks are invading Earth. The Cybermen are terrorizing the space lanes. And the Sontarians and the Rutans are battling to see who wins the galaxy. "Only YOU, the Time Lords and Companions of the Celestial Intervention Agency, can stop these villains from changing the course of history. Your weapons are your wits and your TARDIS. 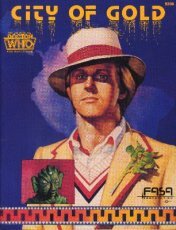 To join the Doctor in his adventures to defeat the foes of the universe, you only need your imagination, a pencil, some paper, and this game!" • A Player's Manual containing character creation rules, rules for play, and a glossary of game terms. • A Game Operations Manual with suggestions on creating adventures, hints for adventure presentation, information on the creation of the campaign world, and rules for judging. 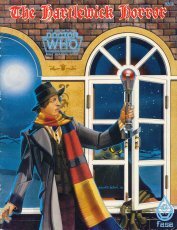 • A Sourcebook for Field Operatives containing a Time Traveller's Handbook, TARDIS Operator's Manual, Visitor's Guide to Gallifrey, equipment descriptions, and much background information." "EXTERMINATE... EXTERMINATE... The metallic voice that screeches these words sends loathing into the heart of every Time Lord. For no matter where or when you are, the DALEKS can, and probably will, show up to not only ruin your day, but EXTERMINATE thousands of helpless creatures. They will stop at nothing in their never-ending quest for galactic supremacy. No act is too low or plan too outrageous for the Daleks to consider. 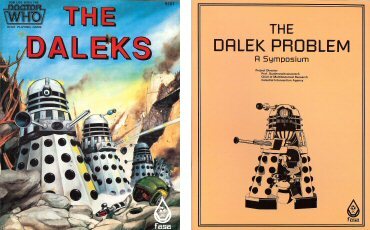 These volumes present the definitive work on the Daleks, compiled by Professor Qualenawtivanastech, the Celestial Intervention Agency expert on the subject. 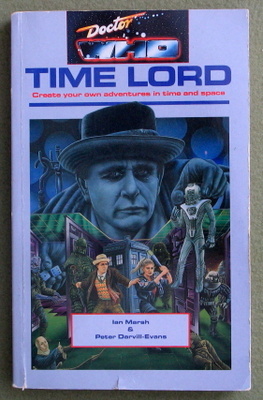 More than 80 years of research and the work of more than 140 Time Lords are represented here. • Dalek Physiology • Dalek Society • Mechanical Function • The Dalek Personality • Time Line of Dalek History • The Dalek Military Machine • Origins of the Daleks • Complete Technical Information • Dalek Expansion"
"Mysterious, devious, and deadly, The Master is the exact opposite of The Doctor. The two have, in fact, been compared to Sherlock Holmes and his arch-rival Professor Moriarty..."
"According to CIA studies and reports, the renegade Time Lord known as The Master is one of the most disruptive forces in the whole time-space continuum. It is now believed that the real goal of all The Master's schemes and operations is to take supreme power in the universe by altering the face of history. The enclosed data entries and reports provide operatives and interested or affected parties new and detailed information on The Master's activities, abilities, characteristics, accomplices and special foes, preferred equipment, and possible locations for future operations. 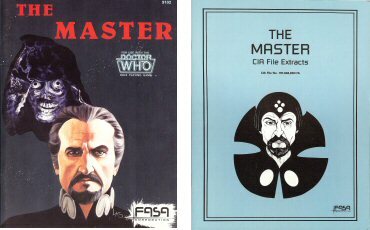 * Introduction * The Master's Activities * CIA File Extracts * Equipment * Overview Of The Master's Background	* Dealing With The Master * Psychological Profile	* Disguises And Deceptions." Gradually, a green light intensified inside the chambers. At first, nothing happened. Then, one after another, they stirred and plunged through the doors of their cryogenic crypts. Mechanical voices shattered the stillness of the long-dead tomb. The Cybermen were on the move again! 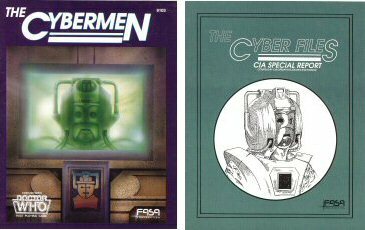 The Cyber Files is intended for players and contains CIA reports and APC data files concerning the planet Mondas, the Galactic Cyberwars, foes of the Cybermen, Cyber-logic, Cyber-technology, Cybermen anatomy, and the history of the Cyber-race. 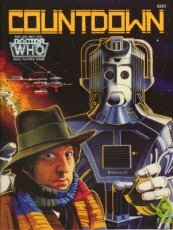 The Cybermen book is for the gamemaster's eyes only and provides detailed information concerning Cybermen and hints for creating adventures." "Out in the fog-shrouded night of Victorian London, an evil force was lurking, waiting to strike. 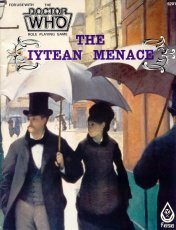 A senseless murder, over a strange artifact, was only the very beginning of the terror of The Iytean Menace . What was the ancient evil, and how had it been awakened? Where would it strike next? "The Time Lord and his Companions had been sent to the capital of Queen Victoria's realm to learn the source of a strange weapon that should never have been on Earth at all..."
...was a monster, vast, implacable, and set on a collision course with the Galaxy of Man. Giant starship and mobile world, Destiny of Ydar is both refuge and vengeance of a long-dead civilization which must be stopped, or worlds will die. The cooperation of the Ydarans is vital. To bad they're caught up in a civil war just now. Too bad, too, that they've forgotten the rest of the universe exists..."
"The sudden appearance of a dangerous gravity bubble causes the TARDIS to dematerialize aboard a ship of the Earth Empire on an emergency mission to deliver vital serum to a plague-ridden world. 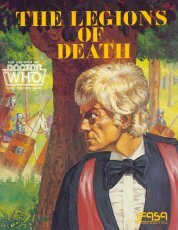 Before the adventure is over, The Doctor and his Companions must contend not only with the death-dealing gravity bubble, but with the ship's paranoid computer, space pirates and an attack by androids as well. This adventure contains the deck plans of the courier ship and extensive notes to help the beginning gamemaster run a role playing adventure scenario." "Why are the villagers of a sleepy little town like Hartlewick disappearing? Has the archeological excavation of an ancient Druidic mound awakened something that was better left undisturbed? And are these strange occurrences related to the presence of a mysterious energy field? The Time Lord and his Companions are sent to Hartlewick, England to locate the source of this unexplained energy field. But they do not have much time. Forces are at work to unleash something hideous and all-too-powerful upon the residents of 1923 Earth." "DINOSAURS IN THE TWENTY-FIRST CENTURY? 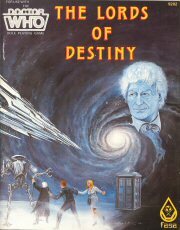 That was only the first mystery that confronted the Time Lord and his Companions when they set out to investigate a violent revolution in an age of turmoil, and stumbled into a plot that could end human history - and change the universe forever. A lost city and a vanished race from the depths of time and hold the key to the destiny of the Earth, unless the adventurers can penetrate the mysteries of The City Of Gold." "A collision in the Vortex with an unknown timeship... a forced materialization on the rocky seaside cliffs of feudal Japan... a power play among the samurai warlords who wield absolute power in an ancient and mysterious realm. For the Time Lord and his Companions, these were only the first steps in a dangerous game, where one man's ambition could bring the collapse of human history. together to free themselves from old Japan, history from a madman's plot, and humanity itself from oblivion in a distant but all-too-real future. To achieve their goals, the adventurers must learn to understand the shifting politics and timeless culture of the Land of the Rising Sun. They must come to understand the samurai and their Bushido... 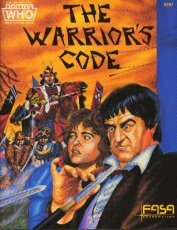 The Warrior's Code."